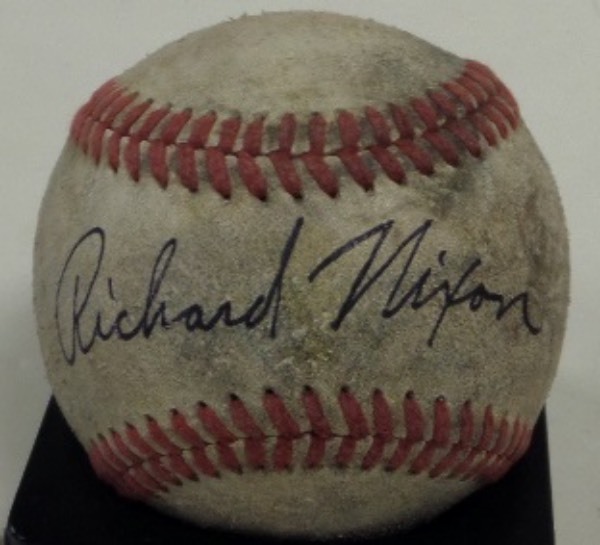 Coach's Corner - Richard Nixon single signed/certified vintage baseball! Go Back to Lot List Richard Nixon single signed/certified vintage baseball! This vintage red-laced baseball is aged and weathered, and in F+ overall condition, but it is fabulously blue ink-penned across the sweet spot by 37th United States President, Richard Nixon. The autograph is a bold, legible 8 overall, and with the former Commander In Chief deceased now for many years, retail is well into the hundreds!